I trained to be a Medical Assistant in only 4 month and then I was placed at an internist's office who later hired me full time at 19/hour between the two offices. Every time I meet another CNA they say they traind at my school, it makes me feel good. The New Millennium Training Center taught me that I don't have to be as "old" as my parents to be earning 40K a year with benefits. I try to work every big holiday for that over time $$ and soon will be getting my own apartment. Just wanted to say thank you to the staff at Millennium. "If you're looking for a well known school" Come to The New Millennium Training Center. My Doctor said he wouldn't even use any of those other schools because he trusted my school. My Medical Assistant career is taking off. I was immediately hired at my externship site because they had to let go the people there that weren't real medical assistants because of the new laws. 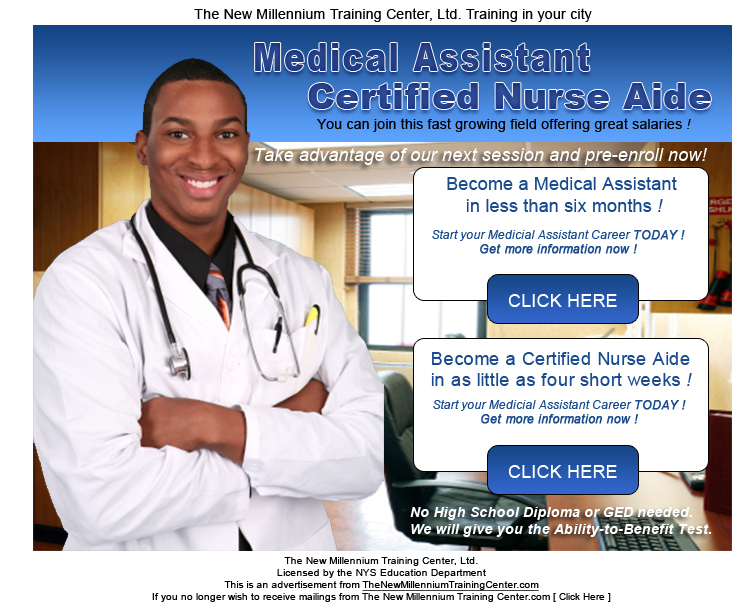 I was very excited to enroll into the Certified Nursing Assistant training program. I have been a CHHA for years and it took me some time but I finally decided to give myself an $8/hr raise and become a CNA with plenty of over times and weekend coverage. Looking forward to making more money and having 1199 union benefits. The school is great !!! Tiffany Joy Scarpa — 5 star Awesome school, great staff and Kelly is one of the best teachers I ever had she is great !!!! Thank you New Millennium !!! I had the best experience at The New Millennium Training Center. My CNA class was quick and easy and not at all like high school. They just concentrated on teaching us my job description and how to pass the state board examination (which I did with flying colors). 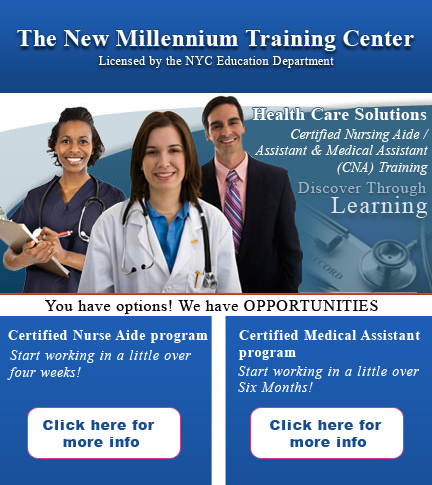 I highly recommend this school to anyone that is interested in becoming a certified nursing assistant. Hoorrraayy!!! I want to commend The New Millennium Training Center for their outstanding school. I became a CNA a while ago and because of the school's good reputation, I wws hired full time immediately. I'm at $16/hr and will soon be on nights getting about $1.50 more/hr so 4weeks/40K plus....Its all good. My CNA class was just what I needed to get out of financial bad times. I did the 4 week class, took my license exam and passed with flying colors (thanks to the school giving us the DOH questions and answers practice exams). New Millennium help me with job placement and prepped me for my interview. $17.50/hr to start, put me into financial freedom within 2 months. I work as many doubles as I can and cover weekends and holidays for extra money each month. I just received a raise and will be going up to $18.75/hr. I put my name on the list to work nights where there is even more money with the night differential(can't wait). Thank you Mr. Art and The New Millennium Training Center for your career guidance. 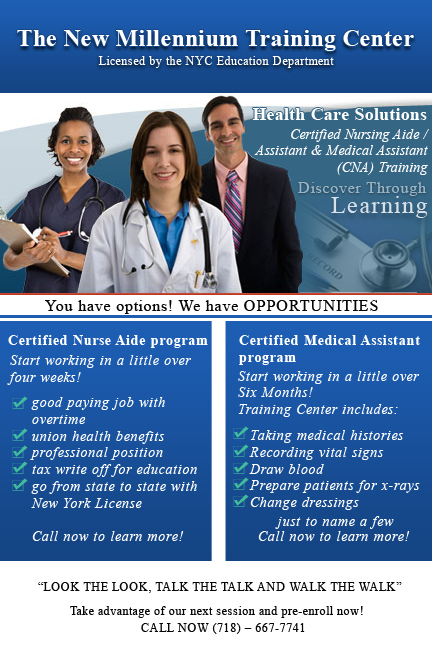 I'd like to share my good news with anyone looking to become a Full Medical Assistant. After completing all of my requirements I naturally took my NHA Certification exam and passed (it wasn't hard as the prep was given to us by the school already). I applied at the hospital and was hired and working inside of two weeks @$18.75/hr to start. I made he right move and so can you !!! TNMTC R O C K S !!!! "Fast and Affordable I had a job lined up as soon as I completed my Externship. I really feel like I'm part of our Physician's practice. I mean they treat me like I'm one of them and in 3 months I will receive an increase of about $ 4 an hour more (45K). 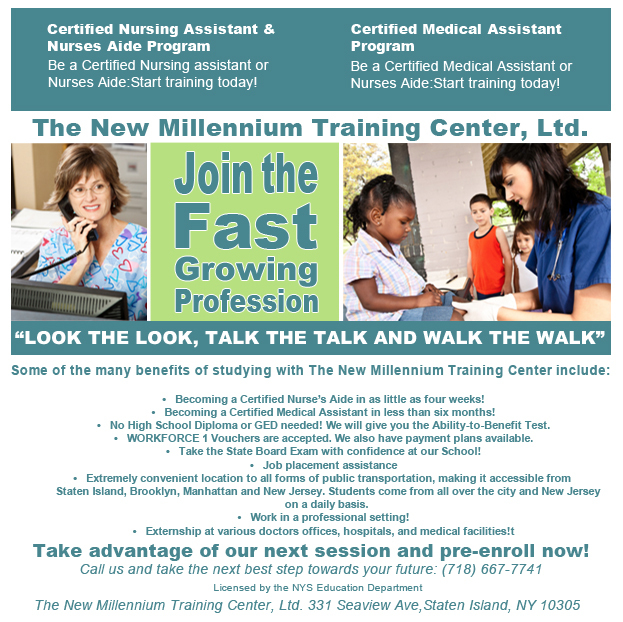 I'm grateful for all of the assistance The New Millennium Training Center gave me in my expert training, my placement assistance and showing me that college was not my only choice.﻿"
Just wanterd to quickly tell anyone who reads this that I had the best experience training to become a NYS Certified Nursing Assistant at The New Millennium Training Center. The class was fun and extremely interesting and we had the best instructors both in class and in the Nursing Home. With all of the practice exams with the answers on the back, the State Board Exam was a breeze and I found work in a little under one week, so I'm needless to say, very happy. Good Job !! I just wanted to write a short note to let everyone know that The New Millennium Training Center has delivered what they promised me. I received an excellent education with relevant experience in EKG, Phlebotomy and various other Medical Procedures. They prepped me on how to look for a position and I pretty much just did what they suggested and before I knew it, there were two job opportunities waiting for me. What a great new start and a bright future.